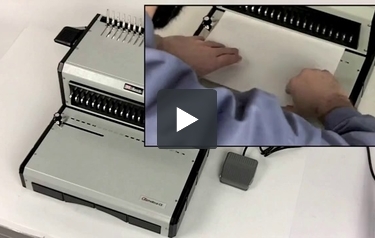 The Akiles AlphaBind-CE is a brand new plastic comb binding machine from Akiles. It is designed to offer the same great heavy duty design as the Megabind-E binding machine at a lower price point. Users who don't need the fourteen inch punching length offered by the Megabind-1E can save money with the AlphaBind-CE. The AlphaBind is an excellent choice for organizations that work primarily with letter size documents or sheets. However, it does have fully disengageable dies and an open throat design for punching special lengths if needed. Check out the AlphaBind-CE today. Fantastic GBC Binder! Cannot go wrong with this product. Fast delivery. Accurate description. Great value. Great price. Has cut our production time in half. In my "former life" as a teacher, I used manual binding machines many times. Now, as an office manager at a church, it was my task to find a binder for our ministry use. We've only used it a few times, but this electric binder is so much easier to use than a manual! The holes are punched neatly and precisely with the nifty foot pedal. The comb assembly (the mechanism on top that opens the comb and holds it while you thread the paper onto it) works smoothly. No longer will my hands ache from pulling down the handle. No more will I have punched crooked holes in the book and ruin it! Saves time, paper and muscles! We really appreciate this electric binding machine! Saves time and aching muscles! We've used a manual forever so this has been a wonderful change! The price was an added factor in our decision to buy now. Welcome to MyBinding video. We’re looking at the Akiles AlphaBind CE Electric Plastic Comb Binding Machine. And this is a demonstration on just how simple it is to bind a book with this system. The machine is powered on with a switch on the back. With your project lined up and ready to go, simply slide the papers into the throat. Using the side margin control knob, you can select and lock down the place where you want all papers lined. This assures that all holes are punched in a consistent fashion. The die disengagment pins allow for punching of all paper sizes without any partially punched holes. And, of course, punching holes is exceedingly easy with an electric punch. Operated here by the foot, or by the hand, you can have full control as you’re lining them up, stacking them up, and putting them in the throat of the machine for the punch; up to 20 sheets of 20lb paper per lift. As soon as your entire project is punched as needed, assemble it all together from the top to the bottom and you are ready to bind with a comb. When ready, place the plastic comb on the pins on the top of the machine. Remember always to keep the comb faced up and the project faced down; that way the book does not come apart. Black lever on the left hand side opens up the teeth of the comb. Again, teeth faced up, project faced down, slide your project over the teeth of the comb. Being sure all the pins are in place, lift the lever back up. Remove your project, and you’re done. It’s that simple with the Akiles AlphaBind CE. For more demos and reviews of this product and many more, check out MyBinding.com. Transcript: Welcome to MyBinding video. We're looking at the Akiles AlphaBind-CE Electric Plastic Comb Binding Machine. The AlphaBind CE is a new plastic comb binding machine designed the same way as the MegaBind series but smaller and more affordable. Akiles has lived up to its name by creating this great machine. The 61 pounds of all metal construction is both heavy and heavy duty. You can't transport it well, but it is durable. Let's take a look at a few of its features. Welcome to MyBinding video. 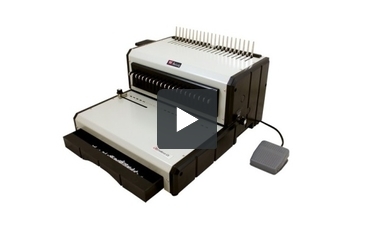 We're looking at the Akiles AlphaBind-CE Electric Plastic Comb Binding Machine. The AlphaBind CE is a new plastic comb binding machine designed the same way as the MegaBind series but smaller and more affordable. Akiles has lived up to its name by creating this great machine. The 61 pounds of all metal construction is both heavy and heavy duty. You can't transport it well, but it is durable. Let's take a look at a few of its features. On one side, there's a side margin control knob which allows you to lock down your papers to make sure they're punched in the same place throughout your whole project. It has a 12 inch punching length; however, with the open throat design, it can also be used to punch legal size or even longer documents. And the die disengagement pins allows punching of papers of all sizes without the fear of partially punched holes. The AlphaBind CE can handle combs of up to 2 inches in diameter. An easy handle-style lever opens the combs that rest on the top of the machine. Its greatest feature is electronic punching with a foot pedal, which allows for fast and effortless punching at 20 sheets per lift at the same time, allowing the operator the freedom of both hands to work with the materials. It may seem insignificant, but we really liked how large the chip tray was and how easy it was to get to and empty right there at the front. A lot of machines overlook this detail and as a result, it's pretty cumbersome to empty the machine or worse, chips begin to build up and cause problems with the working of the system. There's only one plug to plug in and a simple on/off switch and there's a depth margin control knob, which offers four settings to get the best margin distance for each book size. Overall, we're really impressed with the Akiles AlphaBind CE. And with a price point of well under 700 dollars, if you've got lots of punching and binding to do, this is a great machine. For more demos and reviews of this product and many more, check out MyBinding.com. A rugged machine that is meant to be a low cost alternative to the Akiles Megabind E, the AlphaBind CE is designed to work mainly with letter sized sheets, in medium to high-volume production environments. We recently took a look at this new machine and put together a list of some its strengths and weaknesses. One of the things we immediately appreciated about the AlphaBind CE is its low price point for an electric punch. Designed to offer an economical alternative to the Akiles Megabind E, the AlphaBind CE delivers a rugged all metal machine at a price that makes high volume electric punching a possibility for just about any size organization. Operation of the AlphaBind CE is as simple as can be with its very handy foot pedal. This is a really nice function because when you use the foot pedal, you are able to keep both hands on the stack you are punching. The advantage of this is that you will get a more accurate punch with less "fanning" than you might get with a lot of other machines. With its 12 inch throat, the AlphaBind CE is ideally designed for creating books using letter sized sheets. However, if on occasion you find the need to produce documents that are larger or custom sized, the open throat design coupled with the fully disengageable dies make that a possibility. All you need to do is to punch one side, flip it over and punch the other. These two features add a lot of flexibility to the AlphaBind CE and it is nice to know you have those capabilities whether or not you ever use them. The punching capacity of the AlphaBind CE is a rather nice 20 pages per lift. While you can find manual machines that have similar capacities, you can't beat the speed, ease, and productivity of an electric punch. On the binding side, the AlphaBind CE has the capability to bind books that are up to two inches thick, which is just about the limit for comb binding. The AlphaBind CE has a four-setting depth of margin control that allows you to set the distance from the sheets' edge that the holes are made. This means that no matter the thickness of your project, you will always be able to ensure that the punches are appropriately set for the maximum functionality and durability of your books. We really liked how large the chip try is, and how easy it is to get to and empty. There are a lot of machines out there that overlook this detail, and the result is that sometimes you have to move the entire machine in order to empty the tray, or it doesn't get emptied as often as it should and the chips build up a cause problems. Neither of these should be an issue with the AlphaBind CE. The inclusion of the foot pedal is a great idea, but we found its plastic construction to be a possible detriment. For a part of the machine that will be used so often, we found ourselves wondering why is didn't seem as solidly built as the rest of the machine. It should still last you a good long time, but we can see how it's possible that the pedal may have to be replaced a time or two during the lifetime of the AlphaBind CE. What are the measurments of this machine. It list what it weights, but not the machine size. Need to make sure it will fit in our space available. Thank you for your question. The Akiles AlphaBind-CE Electric Plastic Comb Binding Machine measures 18"x 17" and is 11" high. Do you carry combs for this machine? We carry a huge selection of Plastic Binding Combs on our site. Choose the color that you need and then choose the size. Combs are available in sizes from 3/16" up to 2". Combs that are 1-1/8" in diameter and smaller are round and combs that are 1-1/4" and larger are oval shaped.